Download and install it and forget about viruses, spyware and hackers. 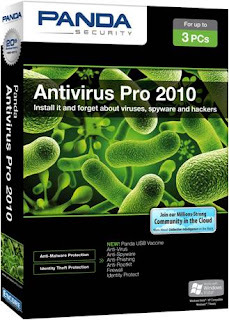 The new Panda Antivirus Pro 2010 is the easiest-to-use and most intuitive protection for your computer. Just install it and forget about viruses, spyware, rootkits, hackers, online fraud and identity theft. Chat, share photos and videos, bank and buy online, read your favorite blogs or simply surf the Web, with complete peace of mind. And thanks to the new Collective Intelligence technology, the solution is now much faster than previous versions. Anti-Malware Engine automatically detects and eliminates viruses, spyware, Trojans, rootkits, bots and other malware before they infect your computer. * NEW USB PROTECTION! Panda USB Vaccine protects your USB drives from infection. * IMPROVED! 80% reduced memory consumption. * IMPROVED - SCANS FILES! in real-time and on-demand. * IMPROVED - SCANS EMAILS! before they reach your inbox, regardless of your email program. * IMPROVED - SCANS INTERNET TRAFFIC! Scans Internet traffic regardless of your browser type. * IMPROVED - SCANS INSTANT MESSAGING TRAFFIC! in MSN Messenger, Windows Live Messenger, Yahoo Messenger and AOL. * IMPROVED! Removes all traces of clutter left by spyware on your PC. Advanced Proactive Protection, technologies from Panda Security are widely recognized as the most effective against new and unknown malware. * CLOUD! New detection technologies include generic signatures and remote heuristic scanning from the cloud. * IMPROVED! Genetic Heuristic Engine combines advanced algorithms to detect new variants of the most dangerous malware families. * IMPROVED! TruPrevent Technologies 2.0 silently analyze the behavior of programs, blocking those that try to damage your PC. This last line of defence blocks zero-day targeted attacks and terminates any malicious activity that has evaded traditional protection systems. Personal Firewall protects you against Internet-borne worms and hacker attacks. * IMPROVED! Smart auto-configuration allows good programs to run while blocking malicious ones. * ANTI-HACKERS! Shields your PC from hackers on the Web. * Wireless Monitor protects your wireless network from intruders. * Intrusion prevention blocks known and unknown hacker attacks and vulnerability exploits. Anti-Rootkit Technology detects and removes silently-installed rootkits used by malware or hackers to evade traditional antivirus products. Anti-Phishing Filter recognizes fraudulent email and protects you from scams while you shop, bank or pay bills online. Anti-Banking Trojan Engine detects the most dangerous identity theft malware used by cyber-criminals to steal banking credentials. Specialized heuristics and generic detection techniques ensure maximum protection for online transactions.